The Inn at White Hollow Farm is conveniently located in the heart of New England. Nearby are covered bridges, State Parks, museums and the quaint towns and greens that make New England so special. Directions From Boston (100 miles): Take the Mass Pike west to exit #2; proceed on Route 102 west to Route 7; take Route 7 south to its intersection with Route 112. The Inn is just past the intersection on the right. From Manhattan (100 miles): Take the Henry Hudson Parkway north until it becomes the Sawmill River Parkway; proceed north approximately ten miles to the Taconic Parkway; take the Taconic Parkway north approximately 50 miles until the exit for Route 44 east; proceed on Route 44 east for approximately 30 miles just beyond Millerton across the Connecticut state line to Route 112 east; take Route 112 east 5 miles. 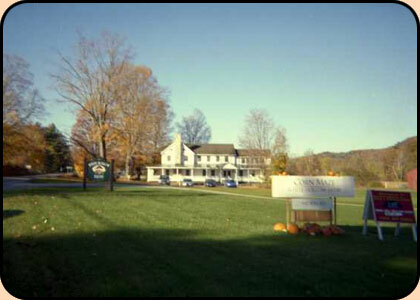 The Inn is just before the intersection with Route 7 on the left. From Hartford (60 miles): Take Route 44 west to Route 7 in Canaan; proceed on Route 7 south to its intersection with Route 112. The Inn is just past the intersection on the right. From Long Island (110 miles): Take the Whitestone or the Throgs Neck Bridge north to the Hutchinson River Parkway; take Route 684 north for approximately 20 miles to Route 22 north; take Route 22 north approximately 50 miles to Millerton; take Route 44 east 2 miles across the Connecticut state line to Route 112 east; take Route 112 east 5 miles. The Inn is just before the intersection with Route 7 on the left. From New Haven (70 Miles): Take Route 34 west to Route 8; proceed north on Route 8 to Torrington; take Route 4 west to Cornwall Bridge; take Route 7 north for ten miles. Bear left onto Route 112. The Inn is immediately on your right. From Pittsfield (40 miles): Take Route 7 south through Canaan, Connecticut to Route 112. The Inn is immediately on your right. From Waterbury(50 miles): Take Route 7 north to Torrington; take Route 4 west to Cornwall Bridge; take Route 7 north for ten miles. Bear left onto Route 112. The Inn is immediately on your right. Copyright © 2000-2013 The Inn at Whitehollow Farm Layout and Maintenance by Ender Design Inc.